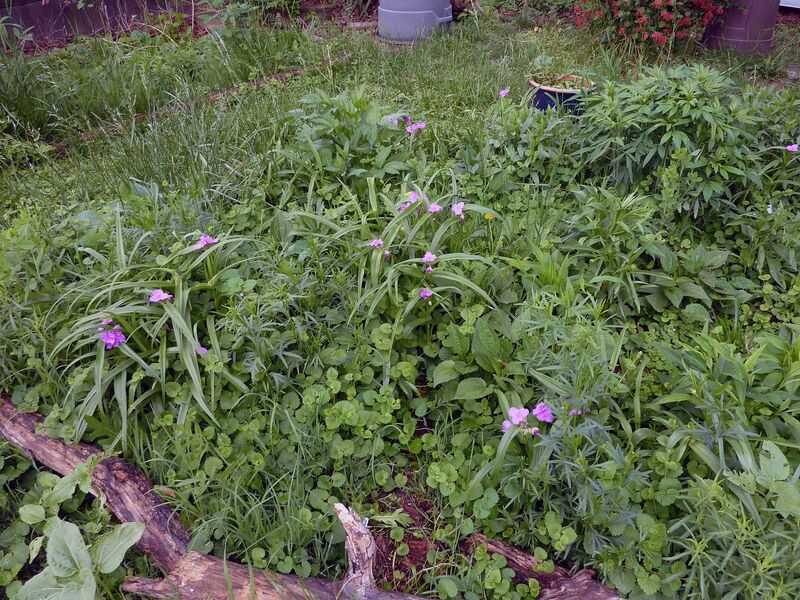 My little meadow garden is much farther along this year than it was this time last year. Mostly this is due to plants spreading both by seed and underground rhizomes, bulbs, and other such root divisions. I need to weed out some of the Creeping Charlie becuase it's climbing all over everything. But otherwise it's fairly weed free. Rudbeckias are coming up all over the place and should form a nice carpet of yellow later in the year, but for now I have the bright pink blooms of Western Spiderwort, Tradescantia occidentalis, to enjoy. 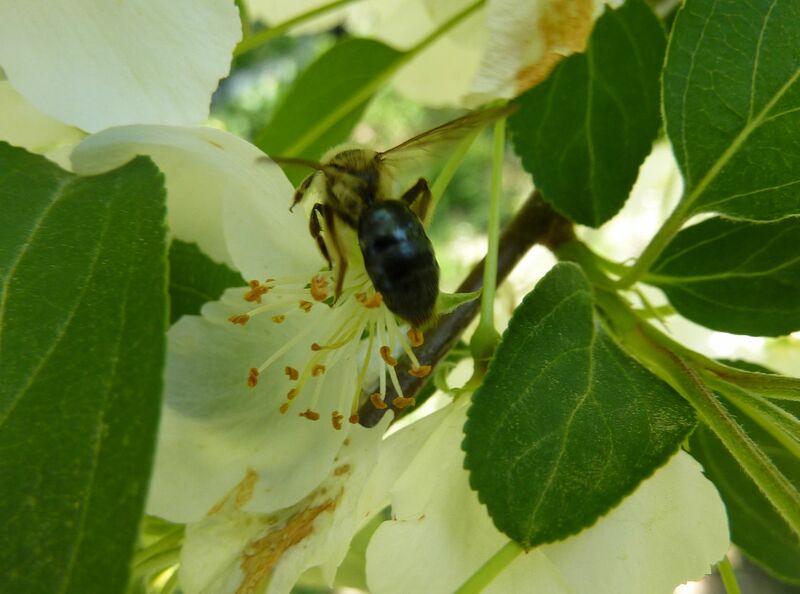 The earliest bumblebee workers as well as an assortment of hover flies have been pollinating them. I love how soft looking the pollen anthers look; as if they were made out of foam or something. Elsewhere in the garden hover fly larva feed on aphids, and somehow go unnoticed by ants or even other aphids. 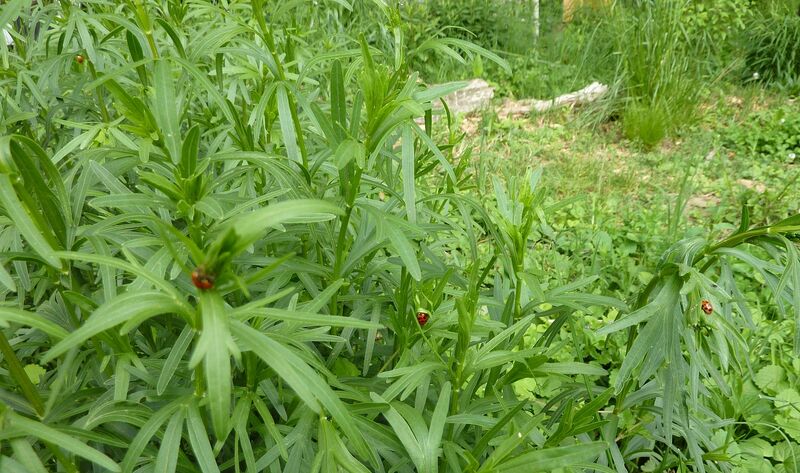 Along the Coreopsis tips a plethora of lady beetles have landed (free of charge) and help to control the aphid numbers. There are four of them in this picture alone. Pavement Ants, Tetramorium species E. have taken to tending some of the aphid herds. This is somewhat unusual becuase pavement ants don't usually climb plant life to obtain a meal, at least it seems less in their nature as seen in other ant species. Leaf Hoppers are a distant cousin to the aphid, but they've opted for mobility and don't have as many associations with ants. 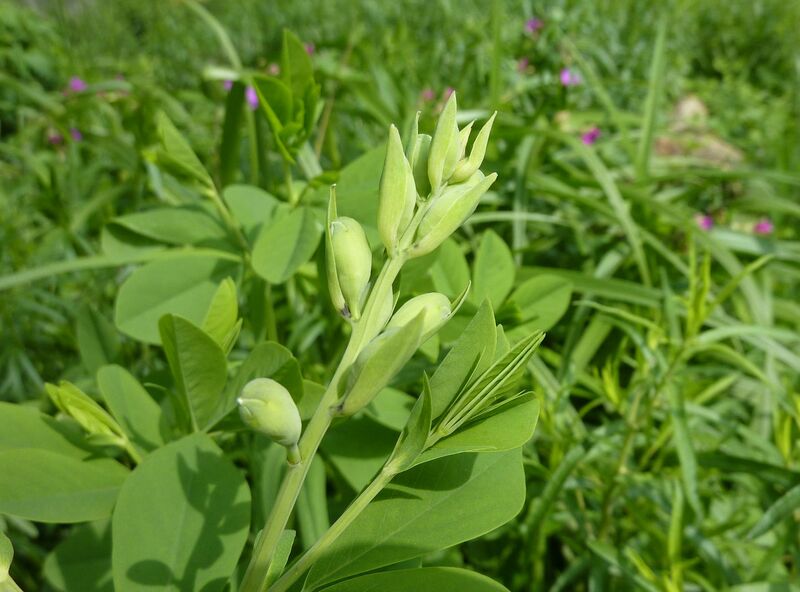 Young Baptisia alba, plants I'd started as plugs when I first planted the meadow garden three years ago are finally going to flower. I'm not sure if the addition of this plant was a good idea or bad. Because they produce their own fertilizer, they're nitrogen fixing, and encourage certain types of plants to grow better than others. Also flowering for the first time this year is Purple Milkweed, Asclepias purpurascens. Last year I took a course at the Mt. Cuba Center about growing our native Elderberry, Sambucus canadensis, which was very informative. They went over the folk lore, how to grow them, how to make jam/jelly out of the berries, lunch was served featuring Elderberry jam, and best of all everyone got to take home a plant. Truly I'm annoyed that I can't find such wonderful classes anywhere else in my area. So here's the plant I took home today. And to my delight, it's going to flower on at least four stems. Now one of the things I learned is that this is a very vigorous growing shrub. They push out multiple 6' stems in a year, form that perfect V shape sought after in so many shrubs for landscaping purposes. Their only real issue is they can spread a little, mostly by new stems coming up on the lower trunk and adjacent roots, however one friend told me that their plants sucker out much farther away from the plant. 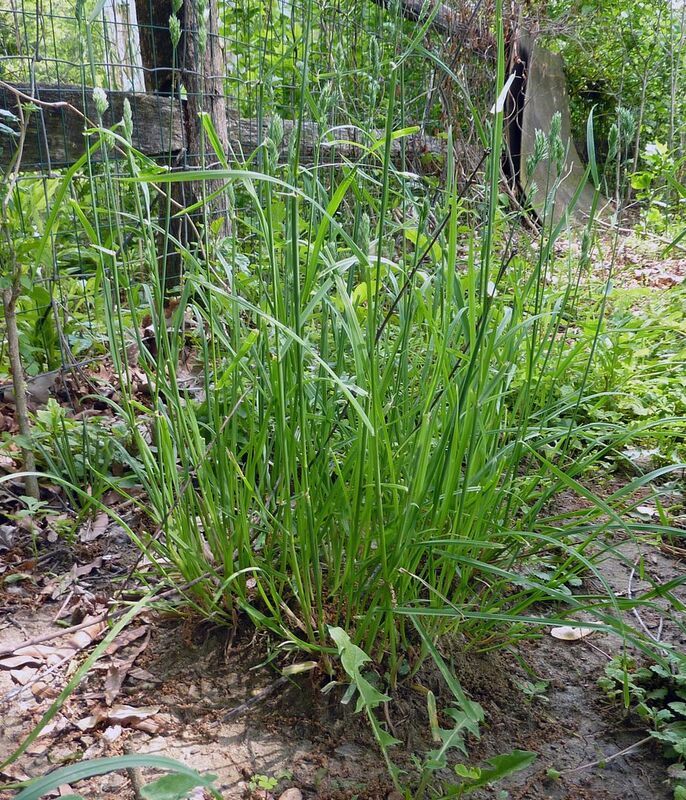 But I have to say of all the plants I've seen, I've never found this plant growing in a colony or grove that such root suckering would create. 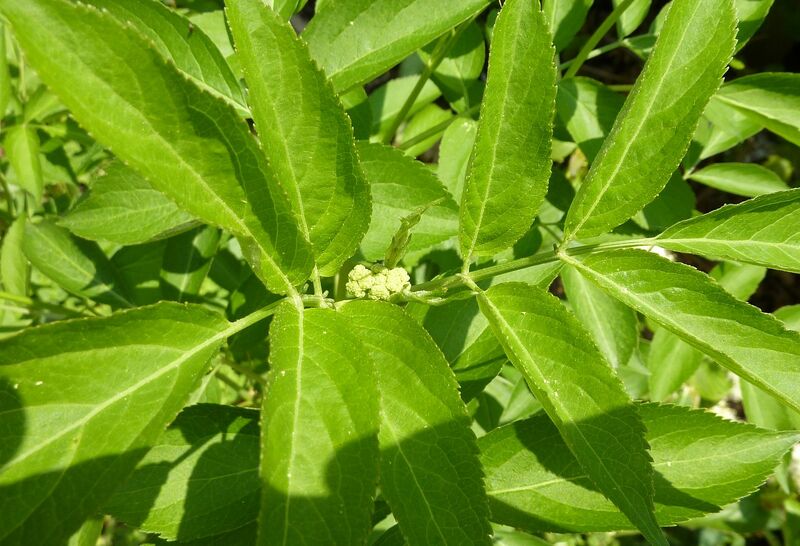 Something brought up at the class were plants that look like Elderberry and there's a surprising number of plants with the same leaf structure such as Poison Sumac, Sumac Trees in general, and a few others too. Also it's not uncommon for Elderberries to reseed themselves naturally anywhere that birds perch. They also root well from cuttings which I think I'll experiment with as they only only live ~20 years or so before they peter out. Yes, it can be done. 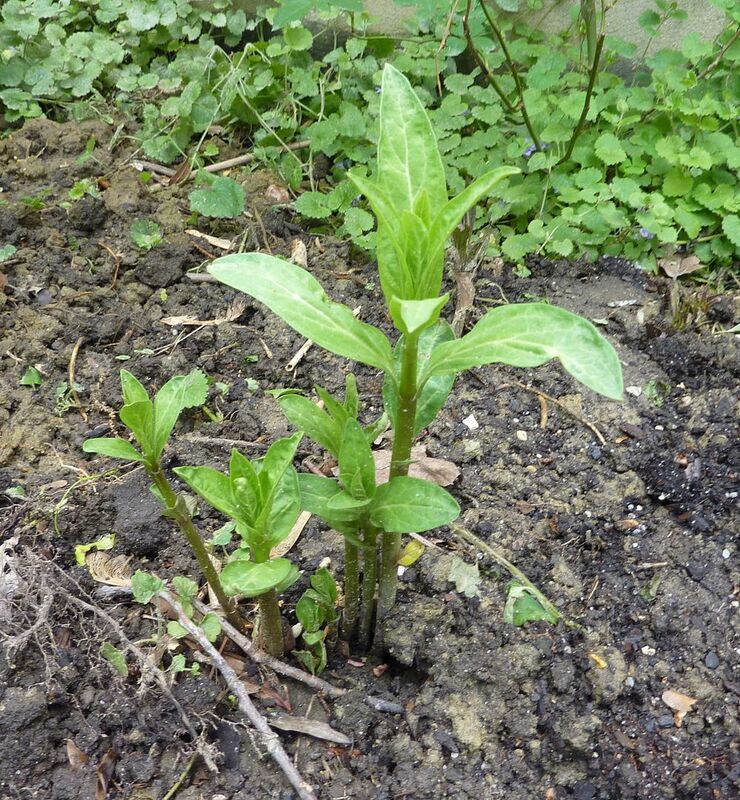 This is an Asclepias incarnata that came up from seed right in the middle of a path leading around the back of our shed. 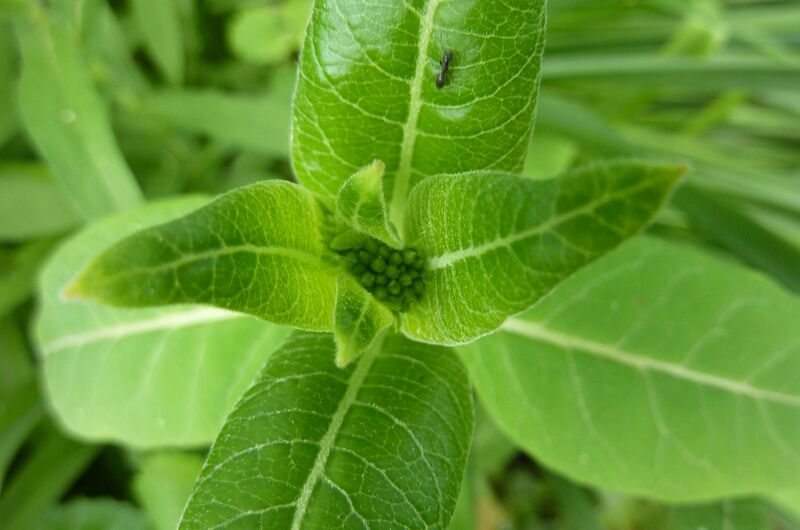 Milkweeds are deep rooted plants, they form a massive tap root that can go down into the earth several feet, usually 6' to 10'. Early in the year though, you can transplant them. You need to do it right before the green growth takes off though. It really shouldn't be taller than the a few inches. Jam the shovel into the earth a few inches away from the stems and plant it down as far as you can get it. Make your cuts all the way around, and then you're ready to make your move. The trap root will cut, but it should grow back. 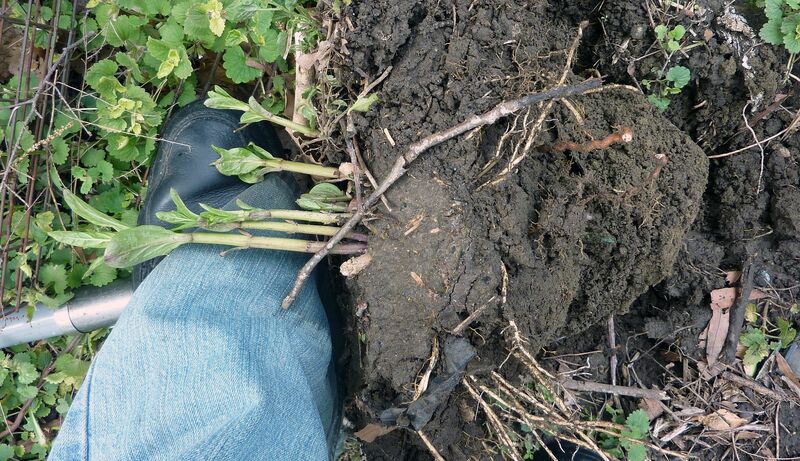 There are also smaller roots that spread out all around which should sustain the plant while the tap root grows back. Now doing this removes the drought tolerance of the plant, so you will need to water it regularly, especially over the summer time. Here I've transplanted it right in the garden; it's been growing fine for a week now, but sometimes what can happen is the green growth will die back... so you don't have anyway of knowing if your plant needs watering. This is kind of where problems happen. So it might be best to put in an annual from your local nursery to grow around it just to remind you that this spot needs watering. 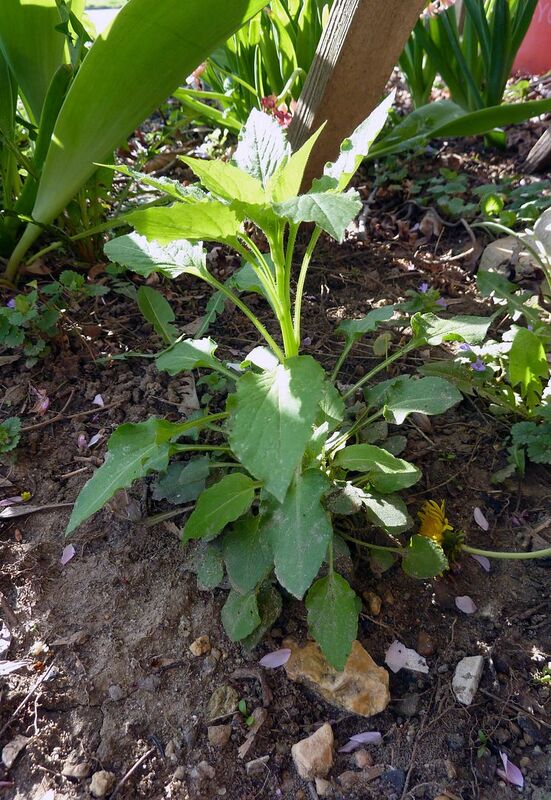 Now assuming the new spot is a place where this species can grow, and it had enough of the roots transplanted with it, it should grow back next year happy as ever, and it should be drought tolerant too or at least have enough green growth that you can tell weather it needs watering. 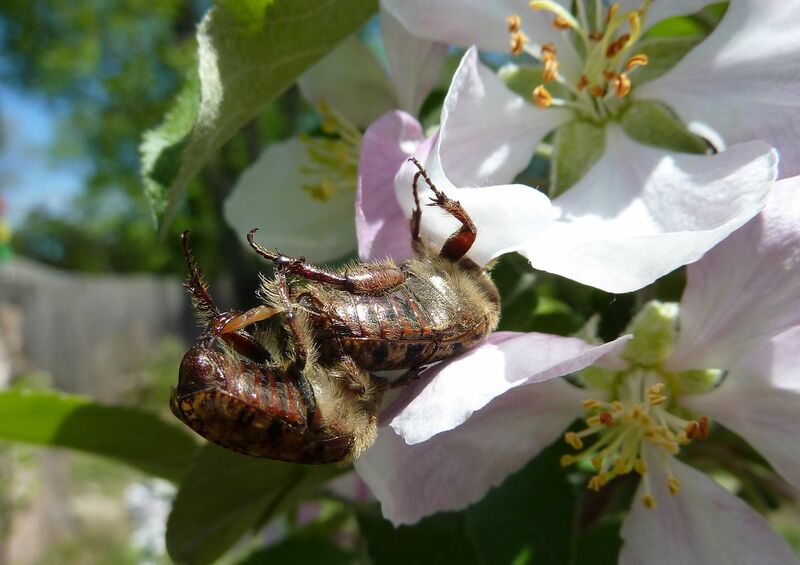 I found these two beetles preforming Cirque du Soleil among the blooms of one of our apple trees. 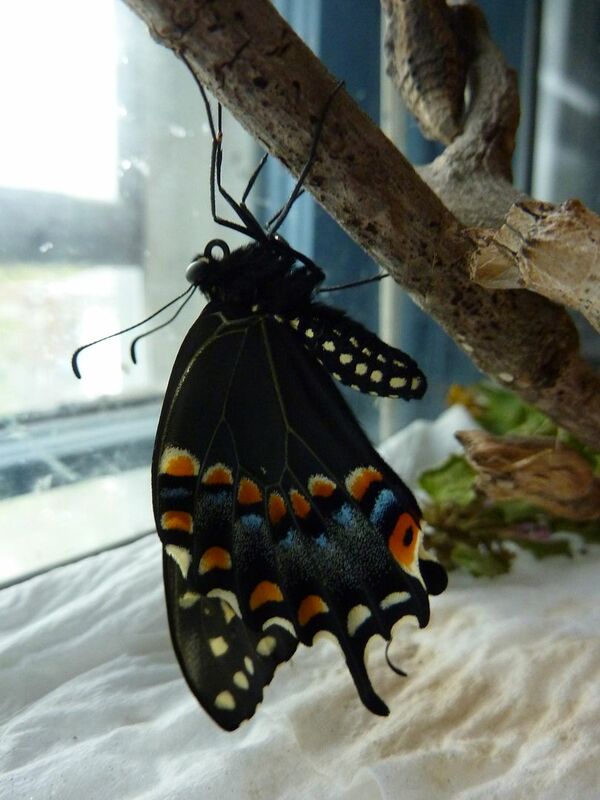 Well that's it for Black Swallowtails I think. 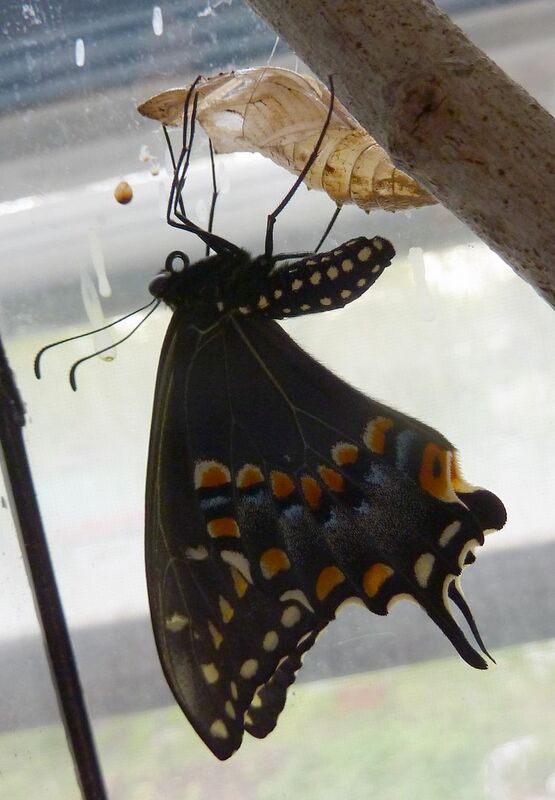 This is but one chrysalis left but I'm not sure if it's alive, or waiting until next year to emerge. Whatever the case I'll be putting the last one out in the garden. 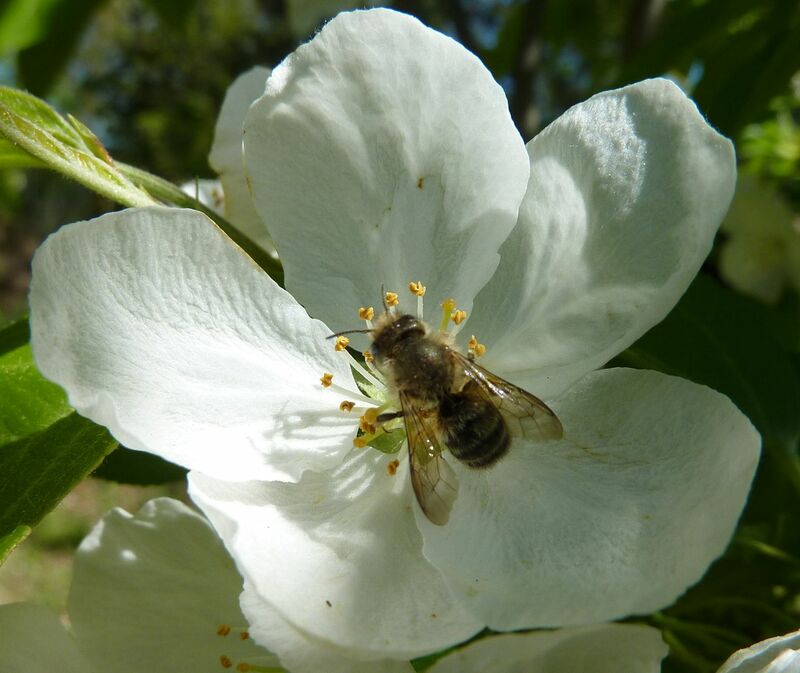 The apple trees have finished flowering but while they bloomed I was happy to find a diversity of bees about pollinating them. 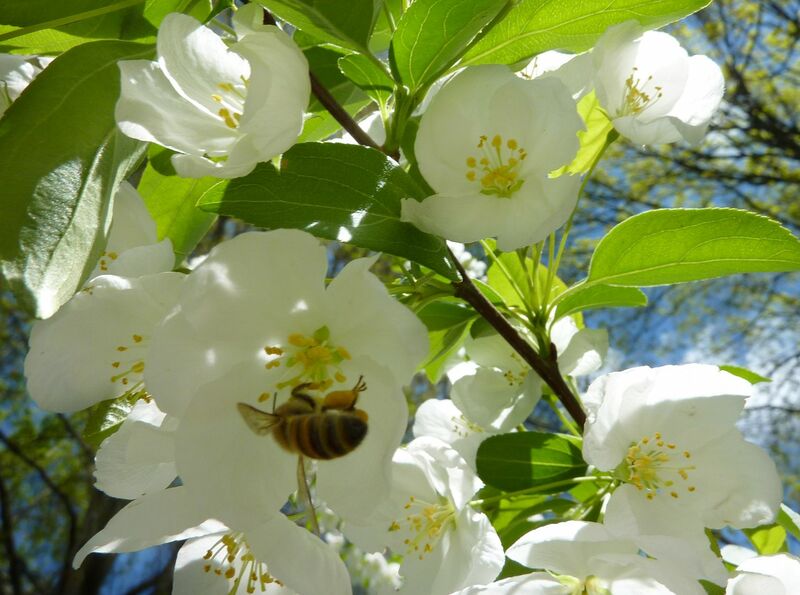 Mostly these little digger and mason bees buzz about from bloom to bloom. 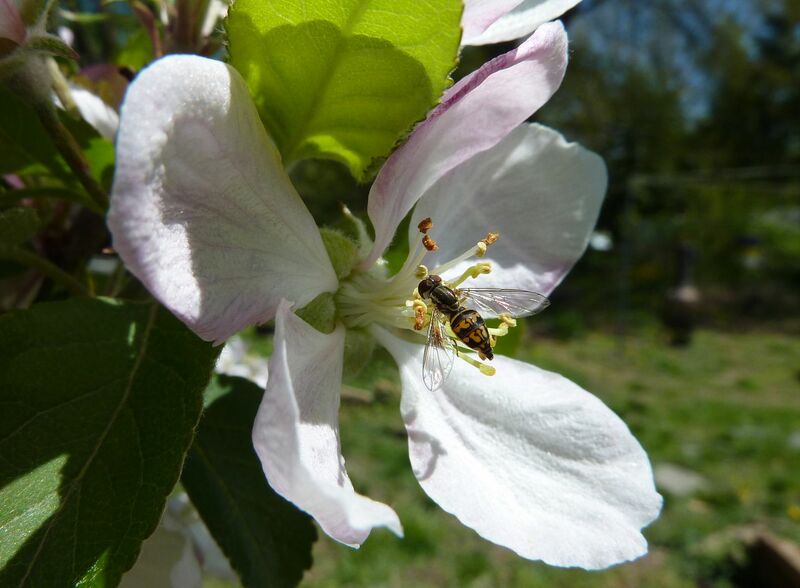 Among the mix this year I was delighted to finally see some of my honeybees joining in. A Hover Fly was also dabbling about. 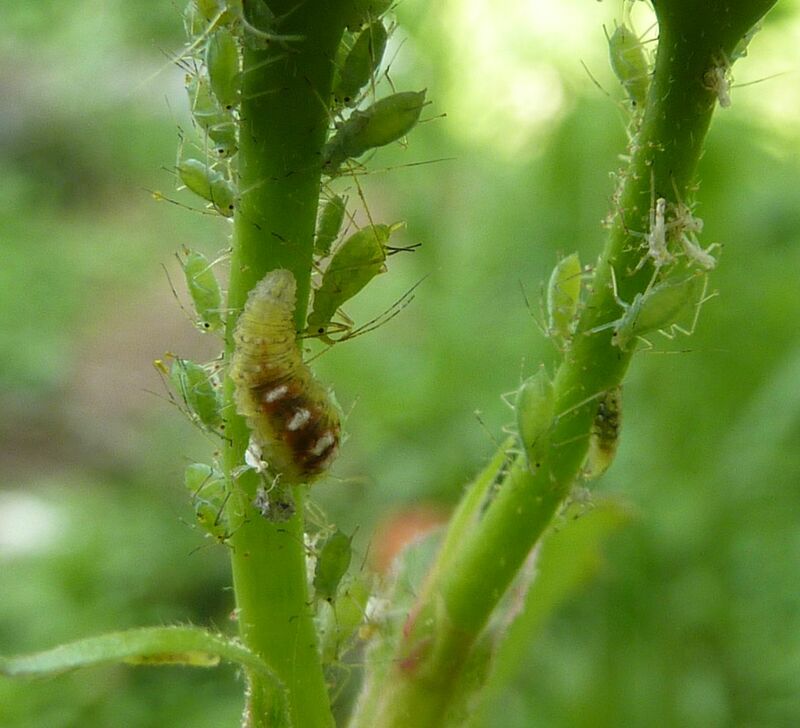 Along with minor pollinator their larva are predators of aphids. 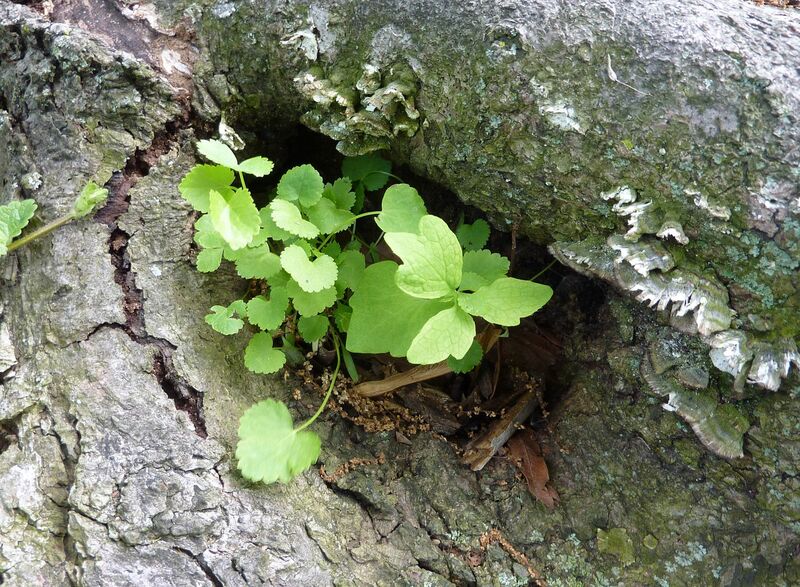 Upon inspecting the yard I realized some seedlings had germinated in the knot of a rotting log. The leafy green to the right is our native Woodland Poppy, Stylophorum diphyllum, the other is all Creeping Charlie, which were likely dropped in there from a plant that grew over the hole (note the stalk to the left climbing up the side). 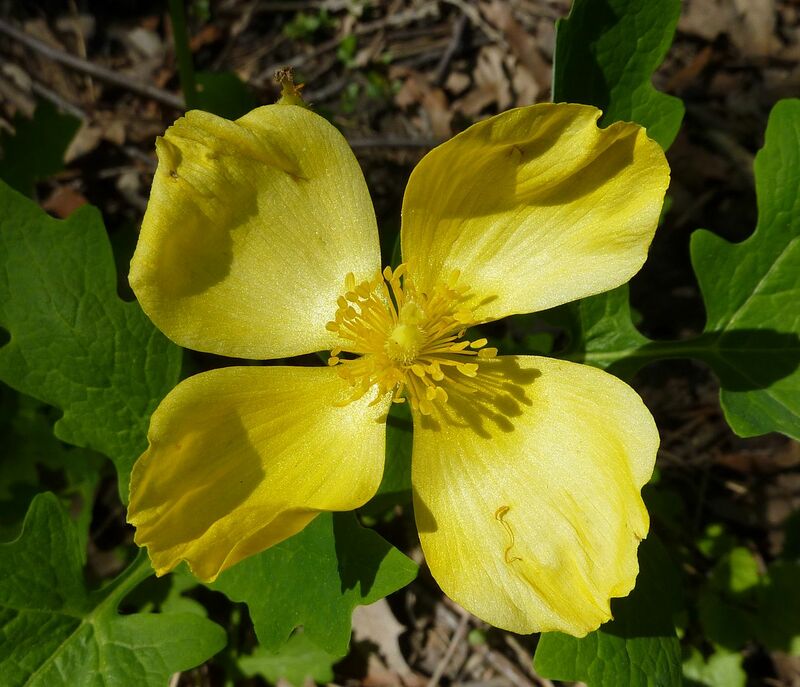 Woodland Poppy seeds have elaiosome on them and are thus dispersed by ants, but even seeds that don't have this substance on them can still be dispersed. 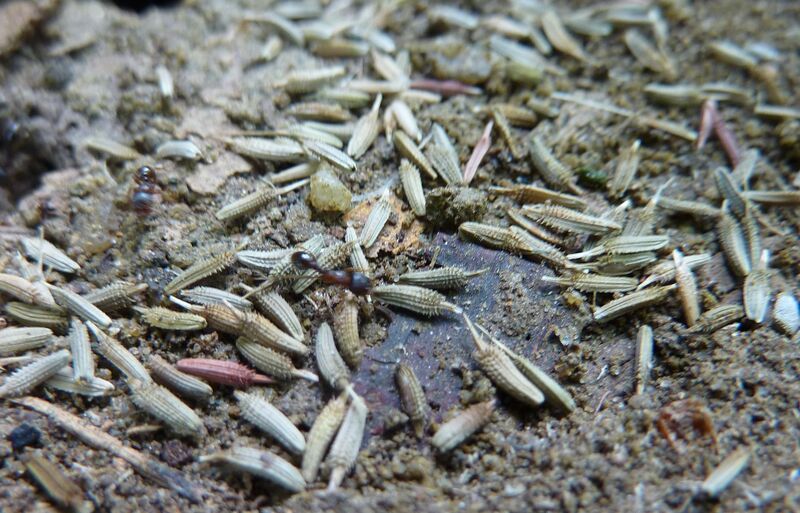 The granary of the common pavement ant, Tetramorium species E. are full of seeds to some sort of grass. While these seeds are eventually ground up to be eaten, the ants collect too many of them and they end up germinating before they're eaten. 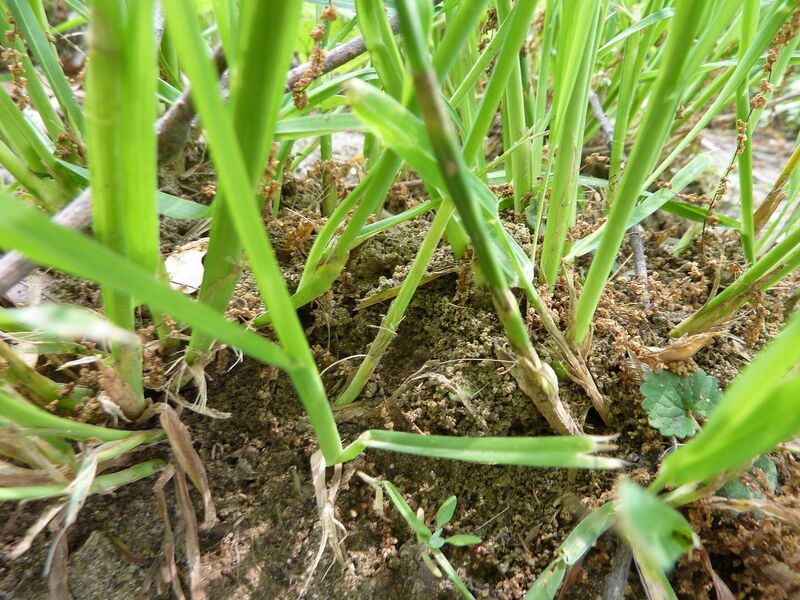 At the stands to a number of grasses you can often find ant hill from species that likely planted them. 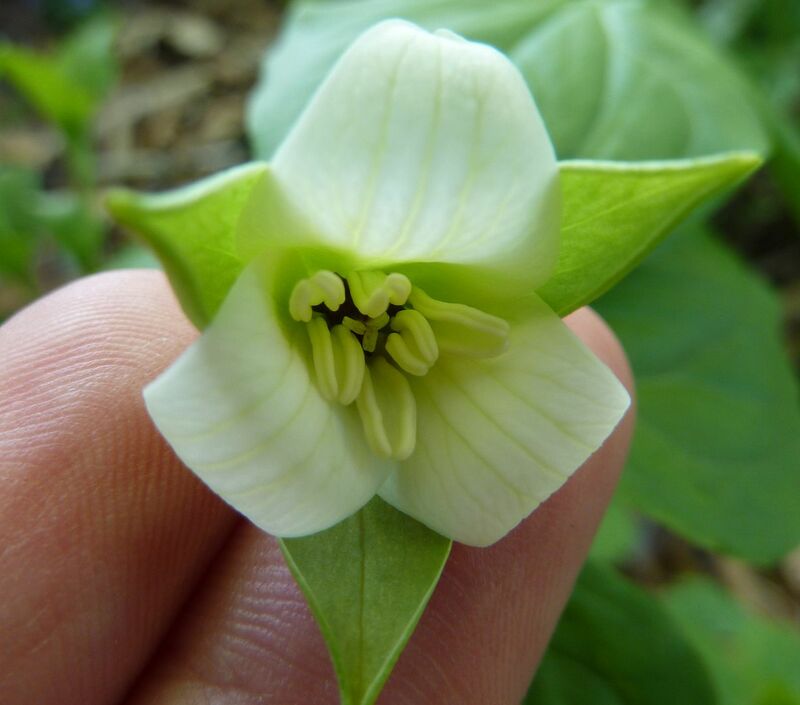 Trillium simile is my favorite Trillium I think. If I were given the choice to have a cultivar named after me or piece of jewelry be made or even just decorating a cake, I think I'd want it to be of this flower. It's a pretty little thing that I only have two of, only one of which flowered this year. There's something about these cream white anthers against the deep red pistil and the white petals against the spearmint green sepals. I need to transplant them out of their current garden, which I intend to do later this August. It's just too dry there over the summer and the seed pods shrivel up. I shouldn't have to water a native plant every day so clearly the conditions are wrong. 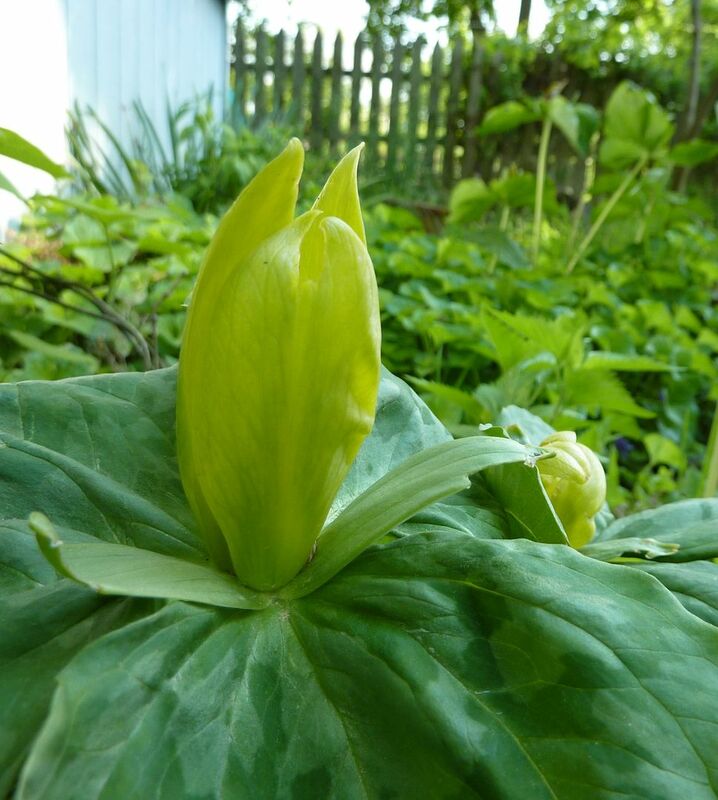 Earlier this year (February I think) I transplanted these Trillium luteum with excellent results. A second plant (not in this photo) didn't do so well. It is green growing just nowhere near as well as the other. I'm giving Lingonberries, Vaccinium vitis-idaea, another try. Years ago I planted some next to the Gooseberry/Currant shrubs but the area proved to be too dry over the summer time and they were dead within the year. They were just four plants that came in 4" pots but were obviously recent cuttings that had rooted because it was just one little stem poking out of the ground. So I decided to try them again, and somehow or other I ended up buying 18 of them! This is excessive even for me and my plant spending habits, though I want to say the bill was something like $60 in total so that's at least an okay deal. The plants arrived in 4" pots (from a different nursery) and looked like very healthy Box Wood-like plants. So I'm very happy with what I got in the mail. From planting them I see they spread some by underground runners so they might eventually pay for themselves. I've planted them into two groups, one is sunny and damp, while the other is shaded, slightly dryer, and also right next to the garden hose. 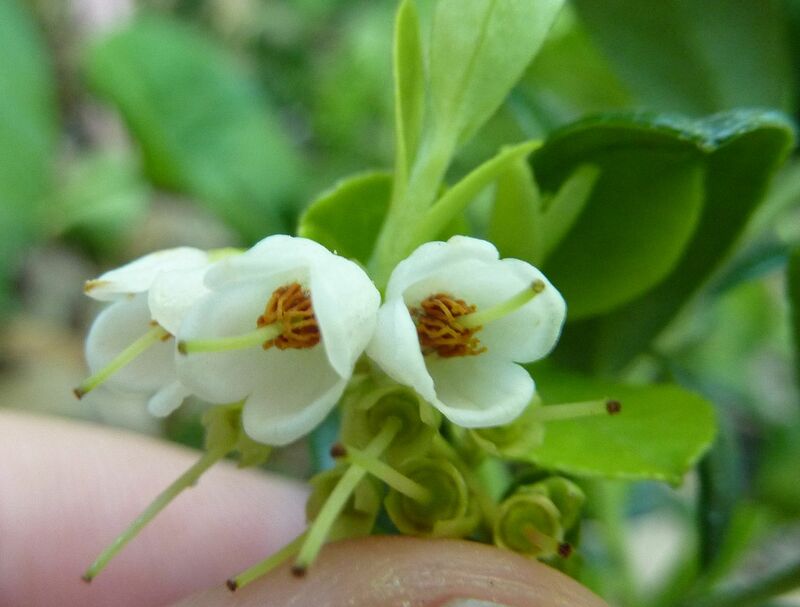 Their flowers are very much like the white bells we see on blueberries, but with earthy orange and red pollen inside. 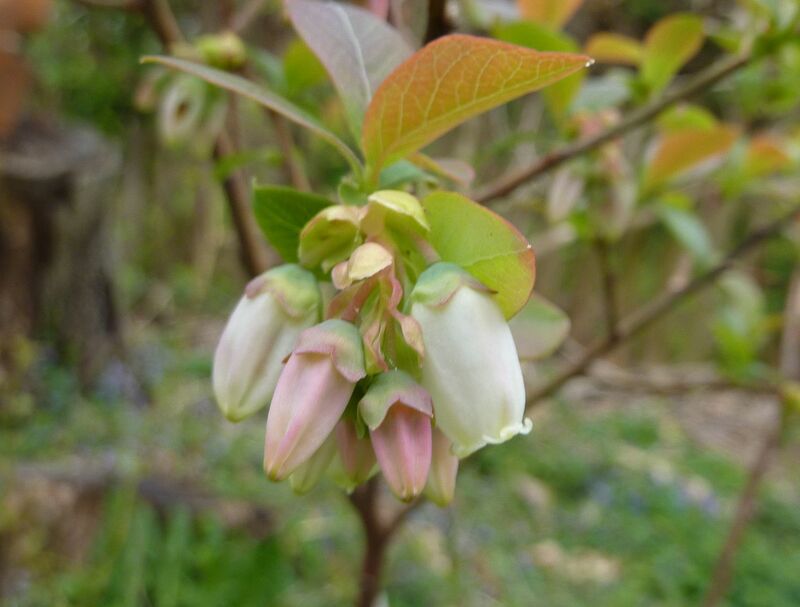 My Blueberry shrubs are also flowering, though I don't believe I'll be getting as many berries as I got last year. One of the six plants actually died. The ones that remain have dead limbs on them that I believe I should prune off. For as much as I love blueberries, I sure wish I could grow them better. 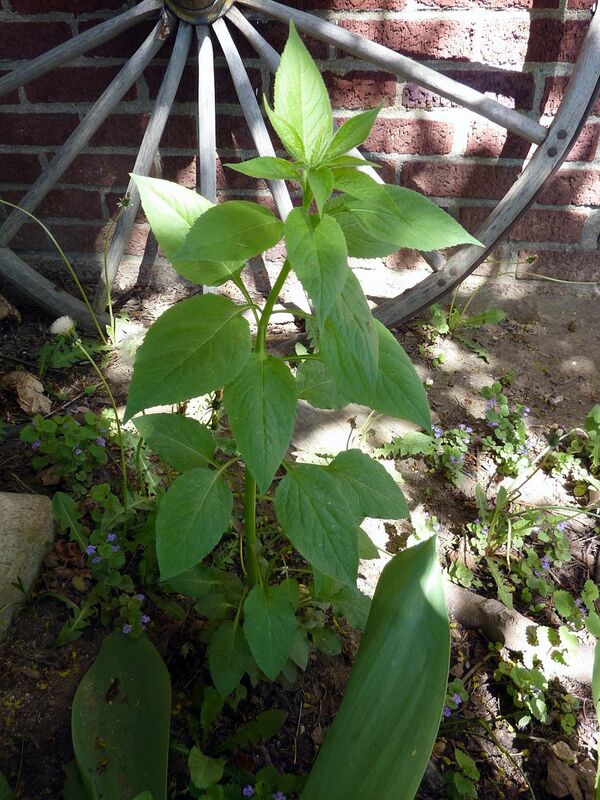 I do add acidity to the soil each spring and autumn, but it doesn't seem to be enough. Hopefully it's just them establishing their first year. 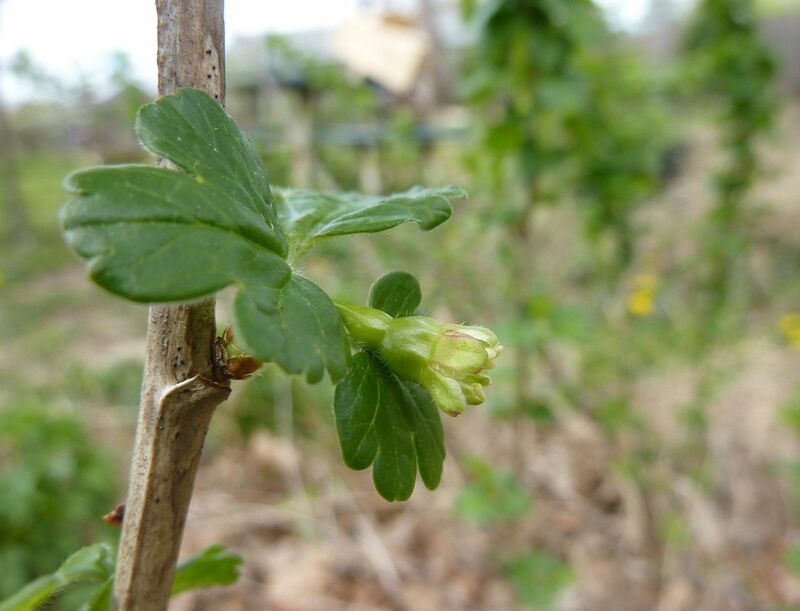 The Gooseberry/Currants flowered too. I think this is one of the western varieties I bought a few years ago. They really took their sweet time just growing to be waist high, but are now flowering at pretty much everywhere that pushed out a leaf. They're very productive plants when they get going. One variety that was supposed to be 'Pixwell' but clearly isn't, is already puffing up its berries. These turn into bright red orbs like Red Currant if I recall right. 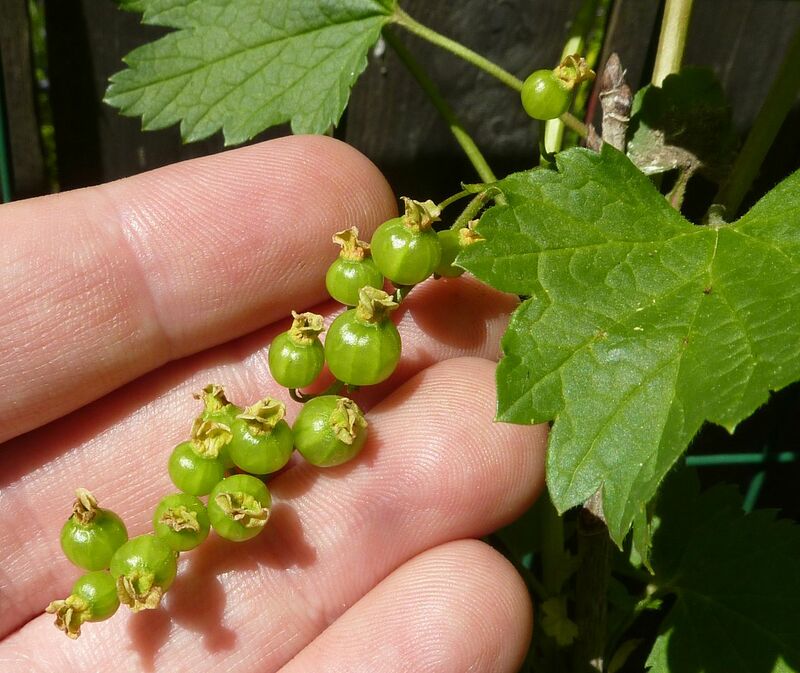 I'm reasonably sure this is Red Currant, which is probably one of the few plants I complain about the most. Their berries are very tart and sometimes bitter, and yet they're addictive. In other words the perfect plant for your masochistic grandmother. So the Woodland Poppies are flowering here, Stylophorum diphyllum. I used to have four of these, but this year I only have three. Now that's normally a bad thing, however they've been dropping seeds all over. Each flower produces maybe 20 seeds, and each plant makes maybe 12 ~ 24 flowers of the course of several months (I've never actually counted). 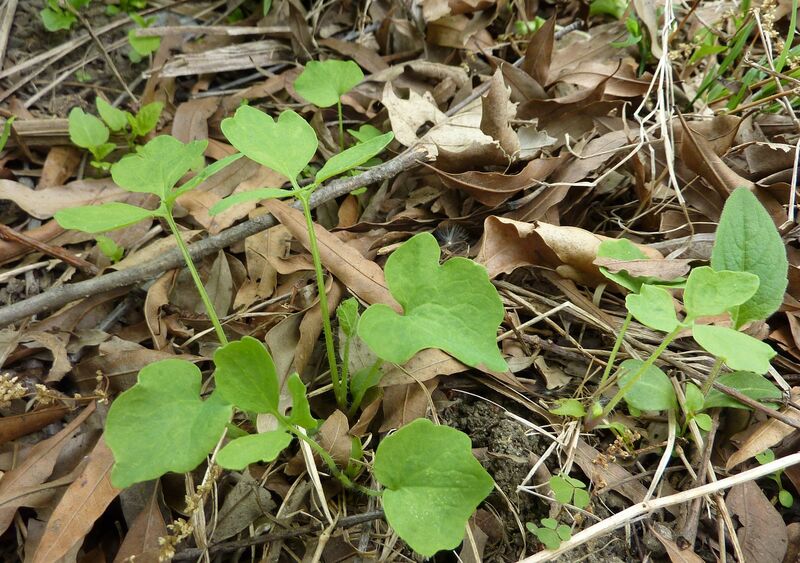 But now I'm starting to see seedlings popping up wherever the ants have carried them. Pictured here are where the one plant had died, but droves of other seedlings seem to be springing out from under logs and garden boards, generally where ants live. 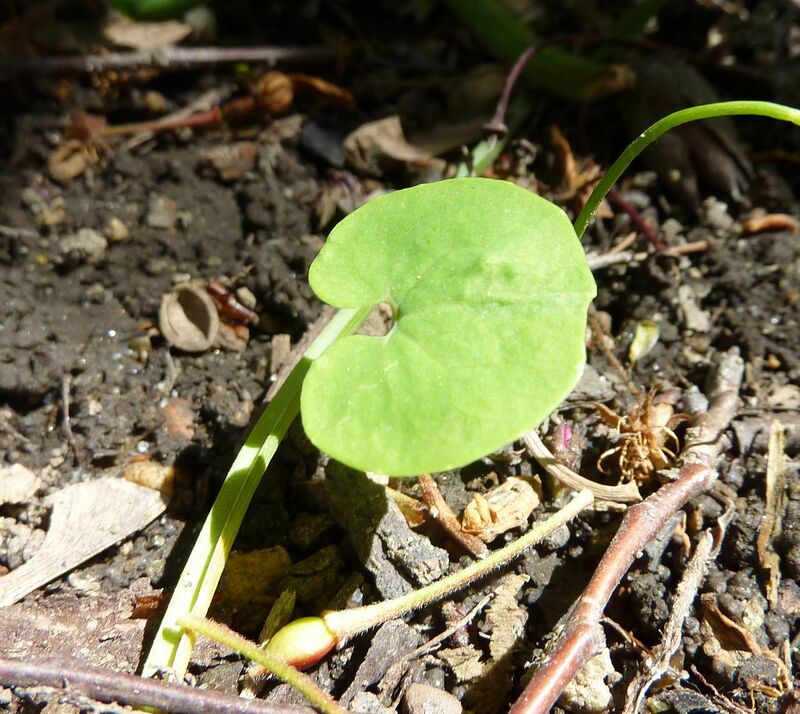 I planted a couple dozen seeds of Bloodroot, Sanguinaria canadensis, two years ago, and I'm starting to see them germinate. 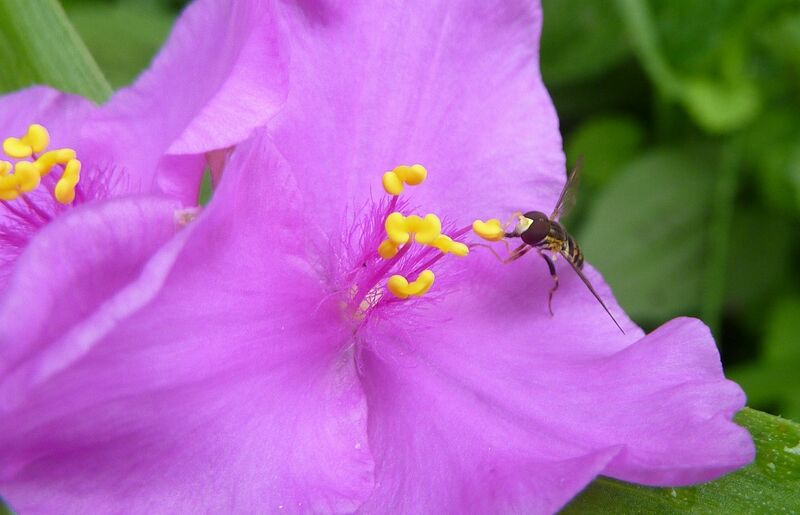 It's an ephemeral who's seeds are normally distributed by ants. That means it's pretty, but also takes the better half of a decade to reach a flowering age. 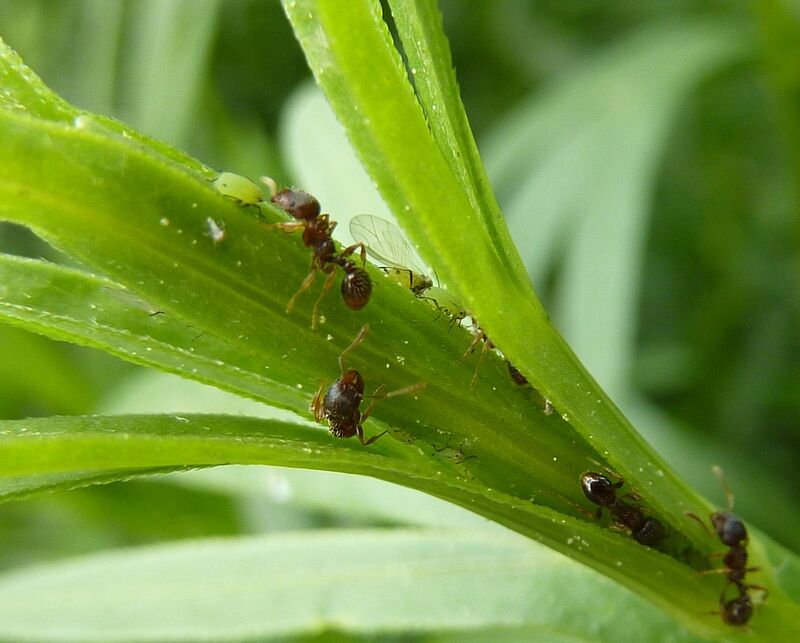 I believe the delayed germination gives the ants a chance to relocate their nest and it would be interesting to map how often colonies of likely seed distributing ants move their nests. I know Aphaenogaster species appear to be best at it and I know they often relocate ever few years. 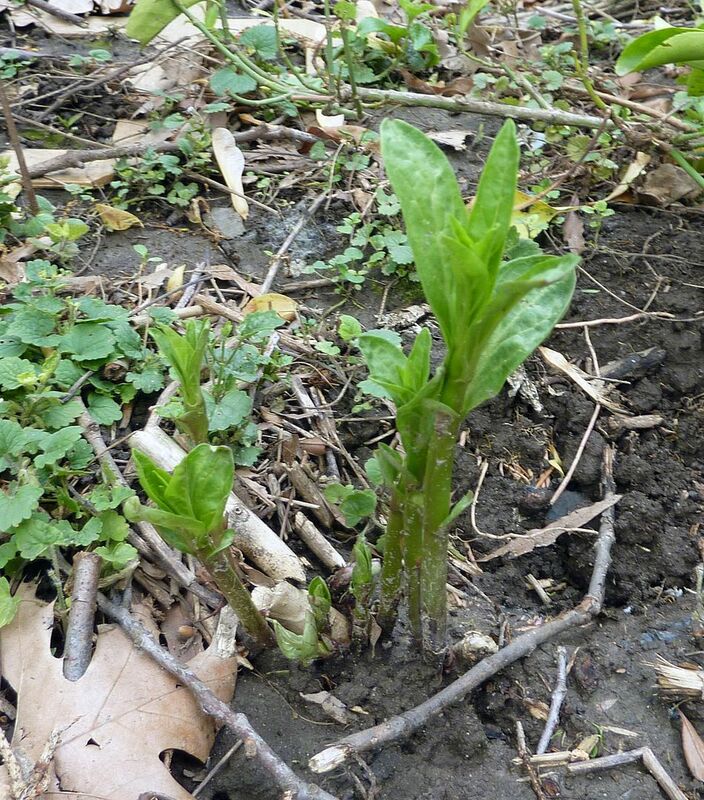 Here is Tall Bellflower, Campanulastrum americanumas, as it looked in late winter. 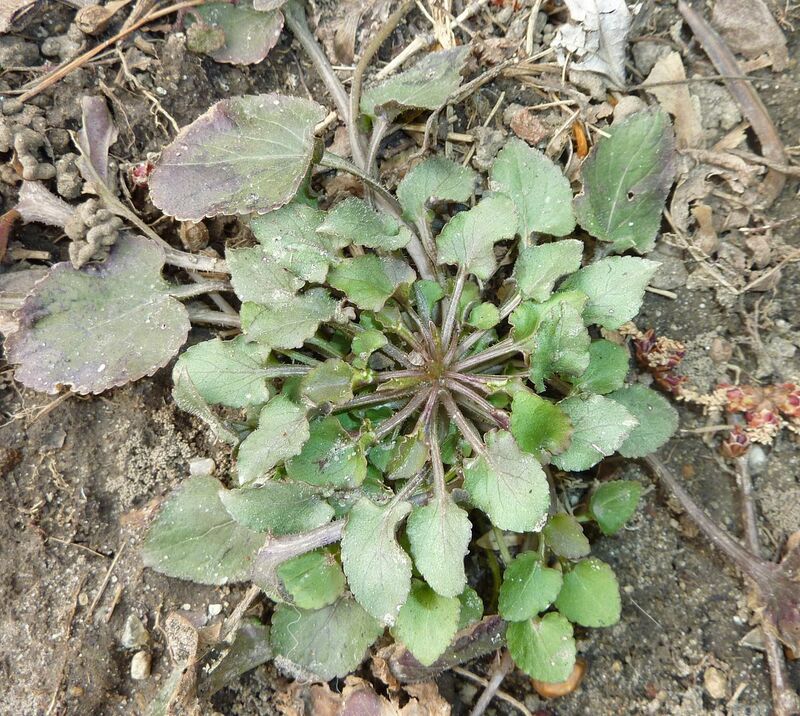 This little rosette of leaves was just a seed I'd planted around this time last year. It's a biannual meaning it completes it's life cycle in just two years. Such plants tend to be aggressive spreading and hopefully this one will be no exception. Tall Bellflower is right. It's grown over a foot in just a month. They can grow to be 5' tall, and start blooming from July to October. Assuming it doesn't require cross pollination with another plant I'm hoping it spreads like a weed. 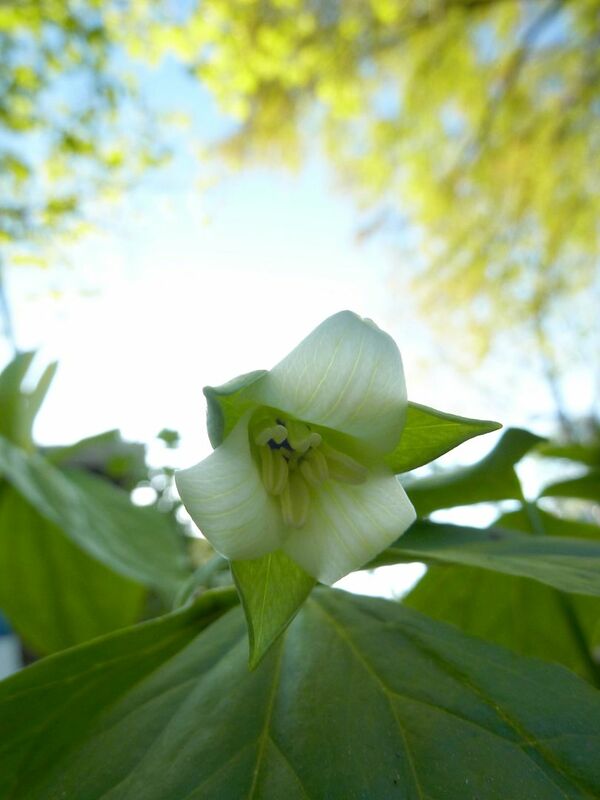 Trillium recurvatum, or as Google is telling me it's also known as "The Bloody Butcher" or "Prairie Trillium." ... Who the hell named it that? I wish I'd known about that common name when I bought the thing. I'd have bought a cow's skull so it could grow out through the eyes. I have a few Oak trees out in the yard, which tend to be prolific with caterpillars. Most of which are fairly bland looking and the one above is no exception. 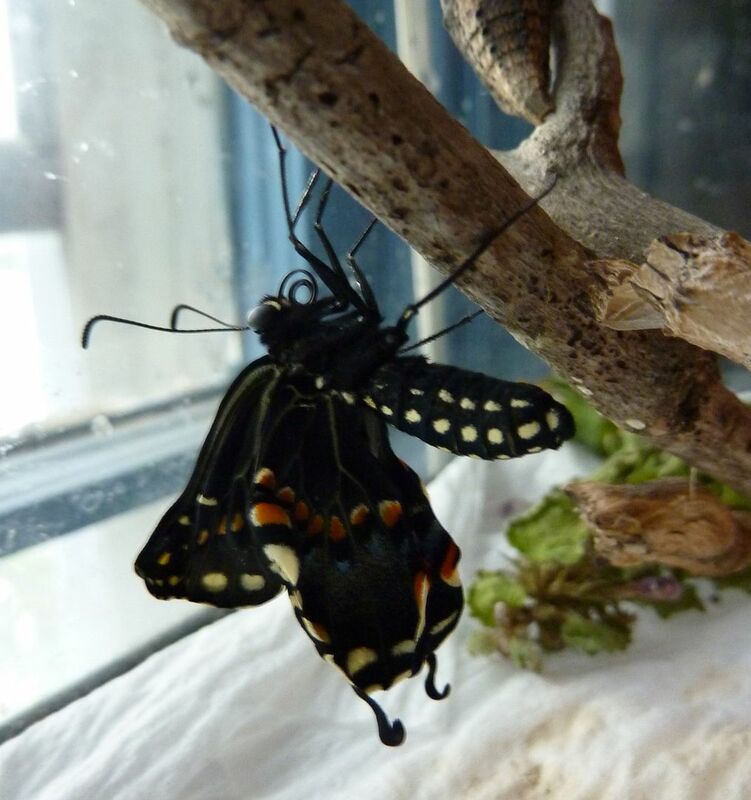 Caterpillars that don't have exotic colors to them or aren't covered in hairs, tendrils, or thorns, have to be cautious as they tend to be the easiest for birds to eat. We have several sparrows and robins nests about the yard so naturally their chances of survival are almost zero. 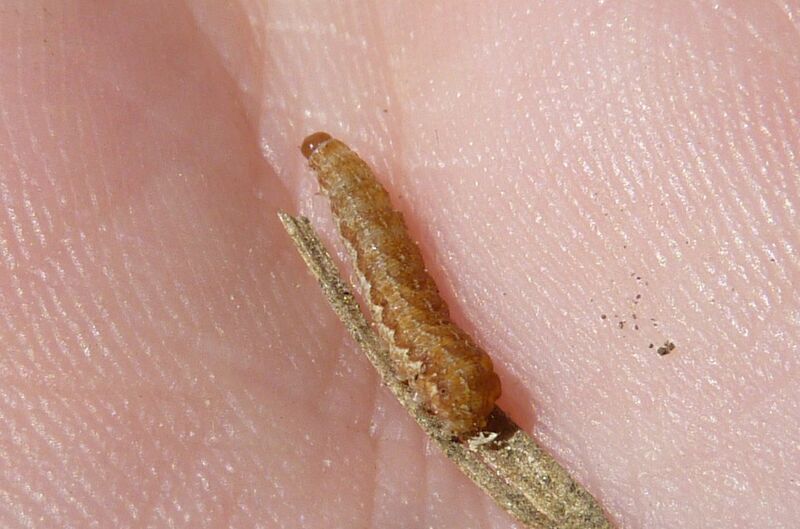 So what these caterpillars have to do to escape being a meal is either hide or jump ship. I see droves of these lowering down from the tree each time a bird lands to inspect the tree. Ideally the caterpillar would lower onto another branch, but there's only so much tree to be had. 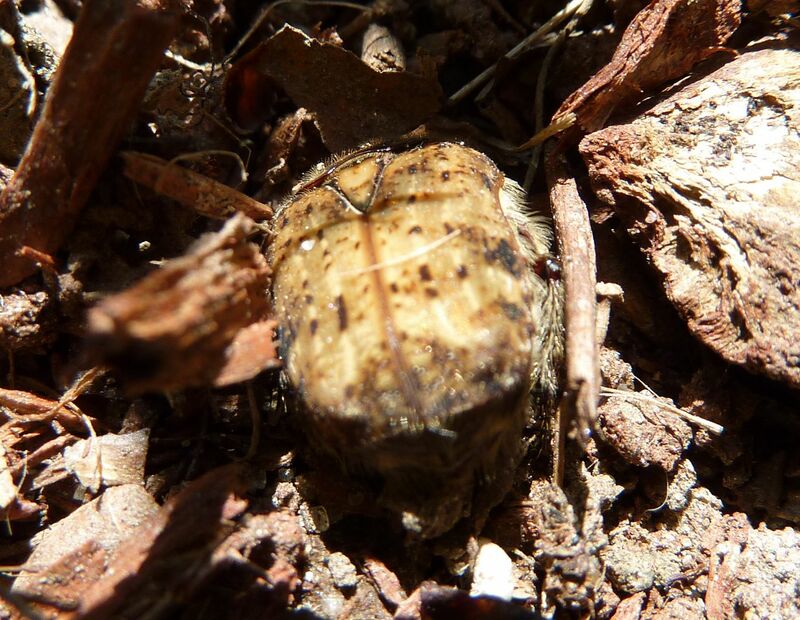 Once they're on the forest floor (or in this case my yard) they need to locate another host plant, typically a sapling or risk starvation. Some can survive by eating last years leaves that haven't decomposed but this isn't as nutritious for them. Directly under the Oak Tree in question is a rather health colony of Camponotus castaneus. 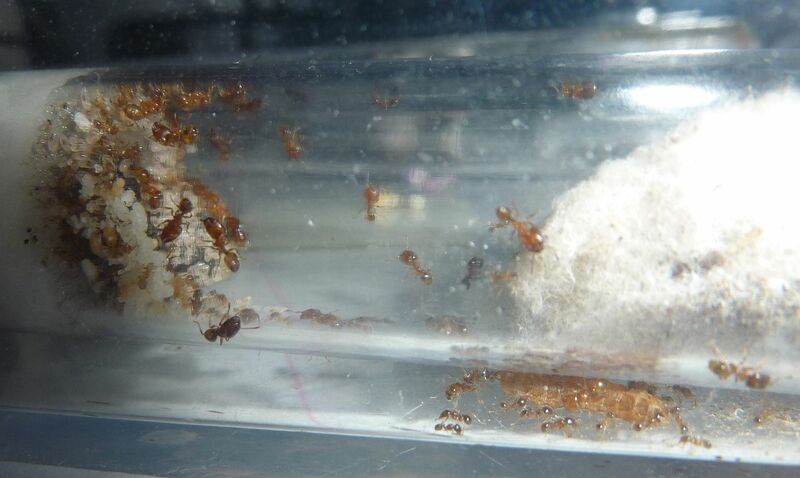 They tend to forage at night though, so until then other forest ant colonies have a chance to collect up some food. Located in the same area were colonies of Aphaenogaster rudis, Nylanderia faisonensis, Prenolepis imparis, and Tetramorium species E. (formerly T. caespitum), as well as a few young colonies Formica pallidefulva, and Formica incerta. All underneath one oak tree. So I fed this little caterpillar to my colony of Pheidole bicarinata, which is a rather tiny ant, commonly found in sandy areas. 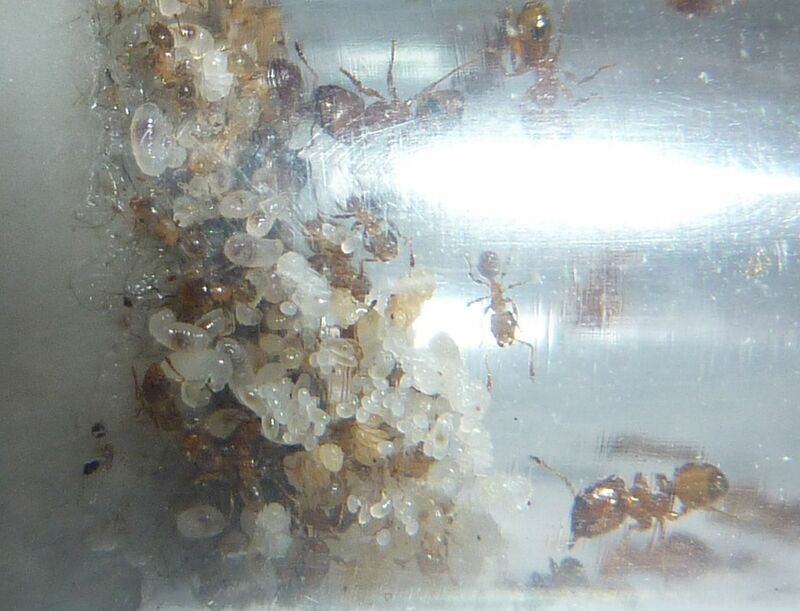 Pheidole is one of the most species rich genera in the world but here in NJ we're approaching their northern limits. They're far more prolific in tropical areas. 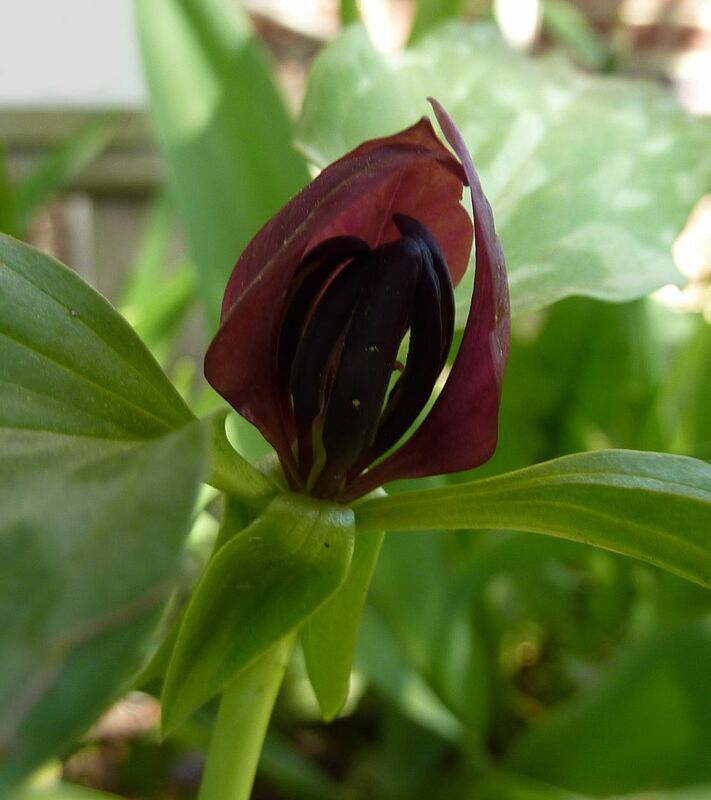 They occur wherever there's lots of sandy soil and full sun to partial shade conditions. Colonies can get reasonably big, but for now this one fits nicely in a test tube. You can sort of make out the queen but she's out of focus and in the back towards the brood pile. The caterpillar tried to hide under their test tube but the ants soon found it and swarmed it. Pheidole is a genus with a polymorphic worker caste. 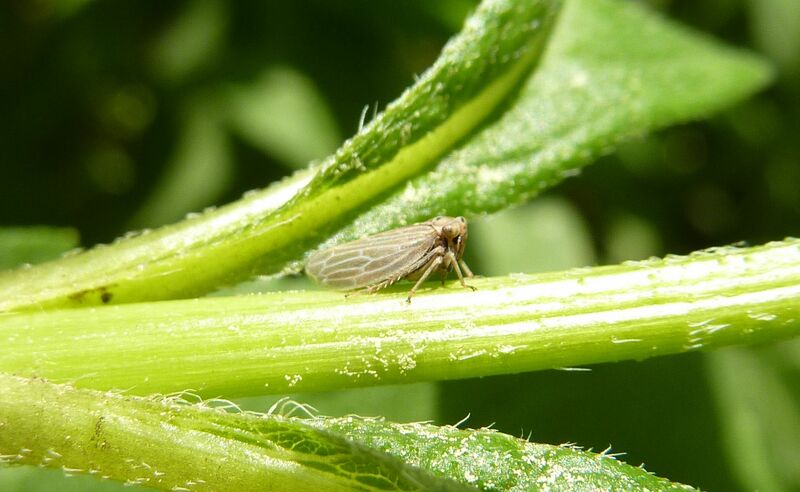 The smaller workers do most of the work while the larger ones are there mostly for food storage, milling seeds, and tearing open food items for the smaller workers to more easily get at. They can also block tunnel entrances with their heads when the colony is attacked.